Interview with trainer to the pros, Ed Downs. 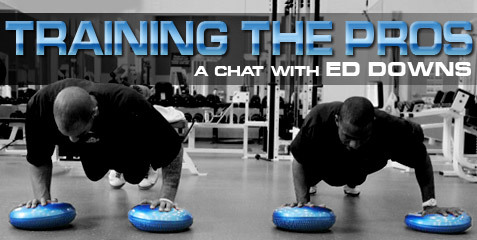 Ed developed the patented Downs Disc Fitness System, a training and exercise system. It is used and endorsed by professional athletes, the University of Miami basketball team, high schools around the country, rehab centers, pregnant women, and thousands of people with weight, type 2 diabetes and respiratory problems. Without corporate funding, Ed realizing his dream through self-financing (by asking clients to pay him in advance), taking out a second mortgage and the sweat equity of 14-hour days. BE: You?re actually training the natural form and function of how the body works. ED: How the body works. How the body works my man. I love talking to somebody that understands what I?m talking about. Because sometimes it sounds so technical but it?s not really that technical. BE: That?s kind of what attracted?you know when Stephanie gave me the e-mails and I started looking into your stuff, that?s what really attracted to me to your style of training. And there are some other coaches out there, not the same obviously but they have similar?they?re trying to accomplish the same goal. You?re taking, which actually in the lab is a fairly complex subject, and you?re making it very simple. You?re just doing what the body does. ED: What it does. I mean, thank you. When we walk, you take your right foot forward and your left arm goes out. We don?t walk with your right foot forward and your right arm going at the same time; you would look goofy as hell. So we want to work in patterns of our natural movement. So I don?t care if I?m working with a lady or a man. A lady carrying a baby and getting ready to put it in her car seat; she?s kind of awkward when she?s reaching and bending down and they wonder why they twist their back. So I?ve got to be able to train their bodies to be able to move in unexpected movement, right?